Creativity, innovation and change are vital to the development and sustainability of all organizations. Yet, questions remain about exactly how novelty comes about, and what dynamic processes are involved in its emergence? Ideas of emergence and process, drawn from a variety of different philosophic traditions, have been the focus of increasing attention in management and organization studies. These issues are brought to bear on novelty and innovation in this volume by examining new organizational and product development processes, whether planned or unplanned. The contributions in this volume offer both theoretical insights and empirical studies on, inter alia, innovation, music technology, haute cuisine, pharmaceuticals and theatre improvisation. In doing so, they throw light on the importance of emergence, improvisation and learning in organizations, and how both practitioners and scholars alike can best understand their own assumptions about process. 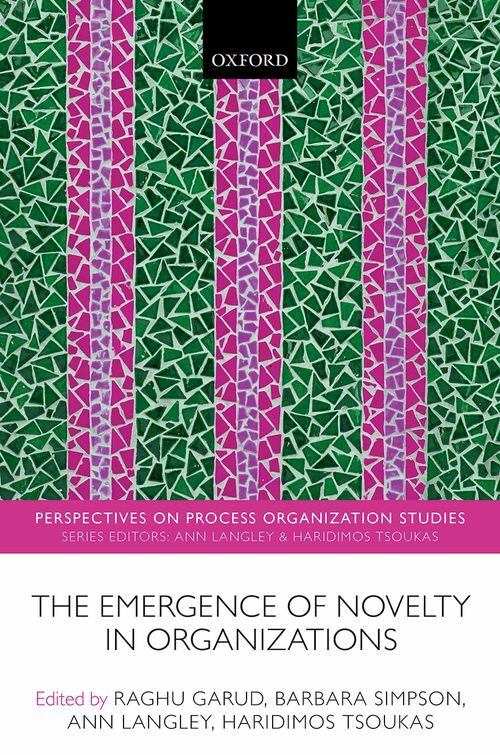 In addition, the volume includes general essays on process perspectives in organization studies. 1. Introduction: How does Novelty Emerge? Raghu Garud is Alvin H. Clemens Professor of Management & Organization and the Research Director of the Farrell Center for Corporate Innovation and Entrepreneurship, Pennsylvania State University. Raghu's research explores novelty emergence. Specifically, he explores how new ideas emerge, are valued, and become commercialized, offering concepts such as path creation, technology entrepreneurship and bricolage as a collective process. One of his recent articles explores how interlaced knowledge across scientists at ATLAS, CERN made it possible for a distributed collective to identify the Higgs boson particle. Another, that also appears in Organization Science, examines a paradox that entrepreneurial storytelling generates - how the very expectations set through projective stories to gain venture legitimacy can also serve as the source of future disappointments and a loss of legitimacy. ; Barbara Simpson is Professor of Leadership and Organisational Dynamics at Strathclyde Business School in Glasgow. Her PhD in Management, marked a sea change from her earlier career as a physics-trained geothermal scientist. Nevertheless, traces of this past experience remain evident in her work today, which brings the principles of action, flow, and movement to bear on the processes of creativity, innovation, leadership and change. She has pursued these interests in diverse organisational settings including hi-tech businesses, professional firms, public utilities, arts companies, SMEs and micro-enterprises involved in the manufacture of plastics and food products. Her current research is deeply informed by the philosophies of the American Pragmatists, especially George Herbert Mead's thinking on process and temporality. She has published her work in journals including Organization Studies, Human Relations, Organization, R&D Management, and Journal of Management Inquiry; Ann Langley is professor of strategic management at HEC Montreal, Canada and holder of the Canada research chair in Strategic management in pluralistic settings. Her research focuses on strategic change, inter-professional collaboration and the practice of strategy in complex organisations. She is particularly interested in process-oriented research and methodology and has published a number of papers on that topic. In 2013, she was co-guest editor with Clive Smallman, Haridimos Tsoukas and Andrew Van de Ven of a Special Research Forum of Academy of Management Journal on Process Studies of Change in Organizations and Management. She is also coeditor of the journal Strategic Organization. ; Haridimos Tsoukas (www.htsoukas.com) holds the Columbia Ship Management Chair in Strategic Management at the Department of Business and Public Administration, University of Cyprus, Cyprus and is a Distinguished Research Environment Professor of Organization Studies at Warwick Business School, University of Warwick, UK. He is the co-founder and co-organizer of the International Symposium on Process Organization Studies (with Ann Langley). His research is informed by process philosophy, phenomenology, and neo-Aristotelian perspectives on reason and the social. His interests include: knowledge-based perspectives on organizations and management; organizational becoming; practical reason in management and policy studies; and meta-theoretical issues in organizational issues in organizational and management research.